This Petite Cheese Board measures approximately 6" wide and 12"long. It is a perfect board and spreader set for serving your cheeses this holiday season. Works great for toast and also makes a perfect board for serving a sandwich and chips. Boards are available in Ash, Cherry, Maple and Walnut. Spreaders are available in Birdseye, Cherry, and Walnut. This combination is Ash board and Birdseye Spreader. 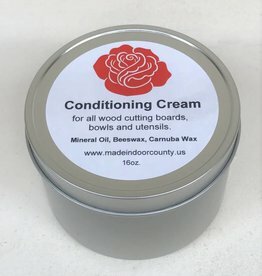 Don't forget your wood conditioning cream to keep all your wooden items looking amazing!